Today is my birthday, and because I was on the ship-my birthday was recognized. My friend's mom wished me a happy birthday over breakfast, which was the usual breakfast of salmon, eggs, etc. We we're here in the beautiful port of Portofino, Italy, which looks like a storybook village. Cute buildings built into a cliff on the edge of the sea. It was a little bit of an overcast, dreary day. This was the day of the Destination Discovery Event. On each voyage, Windstar has a free shore excursion for the entire ship-something unique to explore a particular port of call. To get to this large estate, after the boat tendered in Portafino, I (and the rest of the passengers) boarded the tender to shore (Which was about a twenty minute ride), and then walked about twenty minutes to another boat, a ferry-which whisked everyone onboard to Santa Marherita. Once here-some of us walked, others took a van to Santa Margharita. 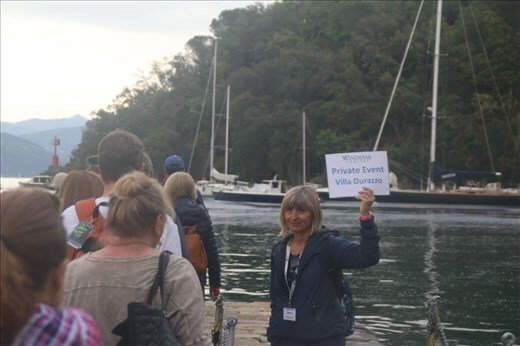 The event was on a large estate in Santa Margharita called Villa Durazzo built in 1678, with a beautiful mansion in the middle of town. We entered the large mansion, and there was a spread of all sorts of Italian foods for us. Chips with gobs and gobs of cheese, pastas, raviolis, and delicious deserts. We sat at the tables and devoured this spread. along with red wine contiously being served. A keyboardist played Italian (or seemingly Italian songs) like Volare. I went on a tour of the house, where the furtniture looked to be from the 1800's, and the rooms had expansive views of the Mediterranean. Then I walked through the garden on such a cloudy day, and walked past beautiful manicured shurbbery and little ponds.